On Monday, I picked up the girls after a weekend with my Aunt + Uncle and we went on an Inglewood adventure. We first hit up Pearce Estate Park which is home to the Sam Livingston Hatchery, Trout Farm + Bow Habitat Visitor Center. It is 15 hectares of reconstructed wetland that showcases many of the aquatic habitats, wildlife and plant species that are in the area. In the summer months, you can explore the park and find fish in the different bodies of water, birds, trails and paths. Greg and I have ran in here numerous times to switch it up from the same old Fish Creek. In the winter, you can also cross country ski in the area. Bathrooms are seasonal so I would imagine they are closed during the winter and most of the spring. They do close at 4pm in the summer although the park itself stays open until 11pm. They also have a playground and several picnic tables to make a day of it. 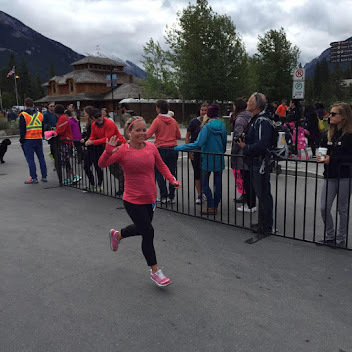 Penelope is walking down the Bow River Outlook to the Harvie Passage weir that was destroyed in the floods of 2013. While you can walk along it and dogs play in the shallow end of the water, you are not allowed to enter the water anymore from this point as it is considered to still be too dangerous. Alberta Environment + Parks has not updated their website with any indication of when this might be reopened to the public since July 2015. The girls loved skipping rocks into the river. If you walk along the path towards the Bow River, you come to what is the Bow Valley Overlook that was completed in 2014. It is so beautiful that I am pretty sure this is where my family photos will be next summer. The overlook is composed of both native plants and hardscape elements from regional landscape material, this textured and multi-layered environmental art work incorporates natural stone walls, boulders, and other elements. 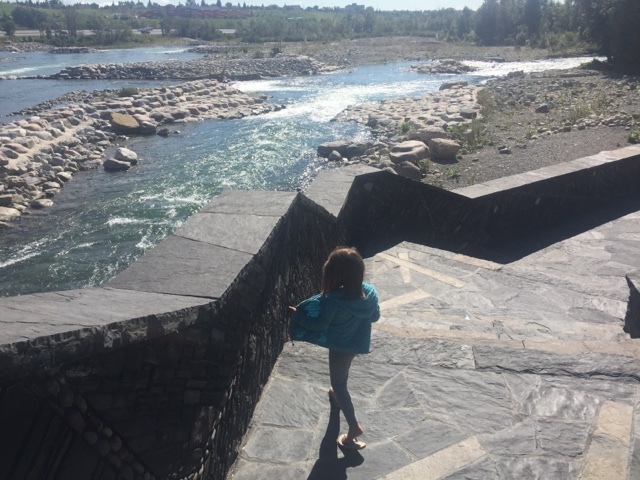 It is an experimental artwork and encourages visitors to explore its platforms and enjoy views of the Bow River, surrounding landscape, Harvie Passage, and in-river activities of the weir. The artwork creates strong physical and conceptual links between the watershed, the river and Pearce Estate Park. 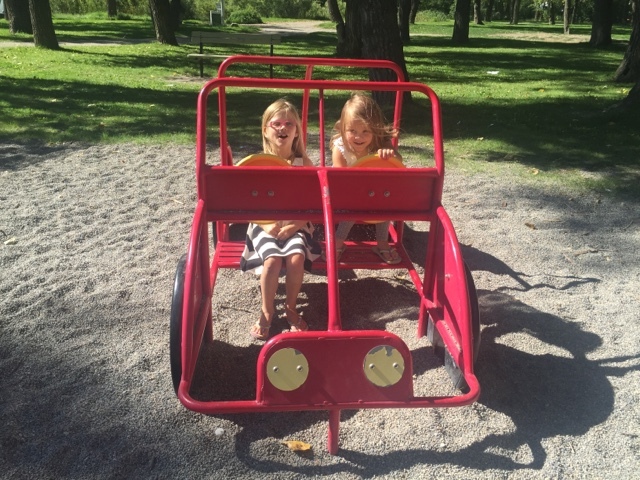 After exploring the wetlands, bow river overlook and harvie passage, the girls played at the playground. To be honest, this park is kinda lame with very few things to hold the interest of kids for too long - especially if they are a bit older like mine. So my advice is this, if you have the time, walk over to Nellie Breen Playground. It is one of most favourite playgrounds anywhere in the world. And it is good for all ages - even big kids like mommy's and daddy's. We were on a mission to get all of our adventures in before the rain came so we stayed at this one. And of course, no trip to the Pearce Estates Park would be complete without checking out the trout farm at the catch and release pond. I don't fish and have no interest in ever doing so but the girls are enthralled by it. I didn't bring anything for us to catch the fish with so we just looked at all the fish we could see. 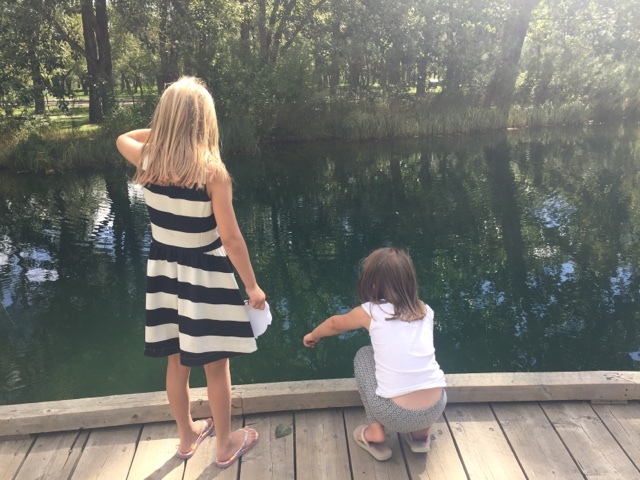 The girls found 4 fish. It was very busy at the pond that morning. 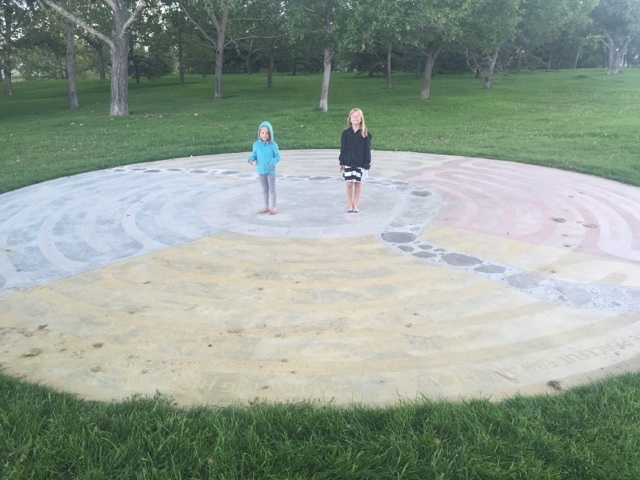 I had read about Ripple on Instagram and had wanted to check it out for myself and since we were in Inglewood, we drove over the outdoor public art. It's located at 8th Ave SE and 13th Street SE. The City of Calgary website says 12th but it is actually 13th. And it's kinda hard to find because you assume, or at least I did, that you just follow the path to the artwork but there is no path that leads you here. It is right in the middle of a grassy field that you have to walk through waking up all of the mosquitos. It was designed by Wade Baker and Mary Tsi of Sky Spirit Studio who studied the natural and design built elements in the Inglewood community. You can read about it further HERE. While it was interesting to see up close, I probably wouldn't recommend making a special trip out to see it on it's own but if you are going to be in Inglewood, then maybe go check it out. I had made lunches for the girls and I to have a picnic but I forgot my backpack sitting on the floor by the garage door so we ended up going to Inglewood Diner for lunch. 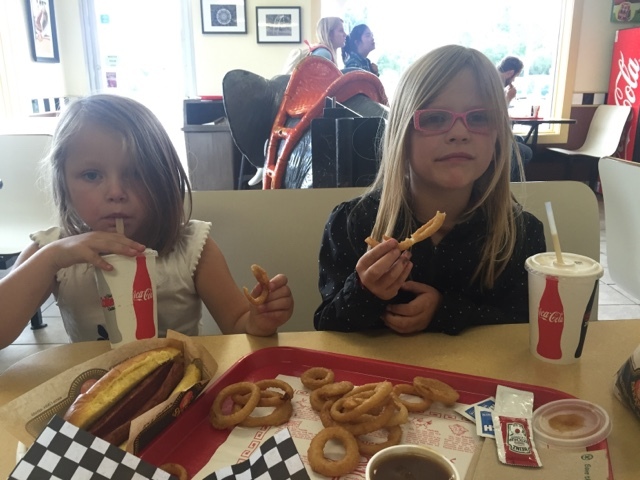 The girls were happy with milkshakes, onion rings and hot dogs. I swear they have the best onion rings around. It is a very busy place there at lunch with all the construction building the flood protection wall around the Calgary Zoo. 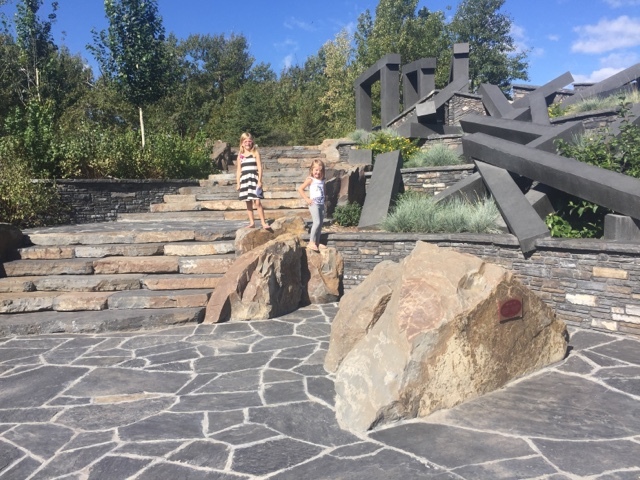 Our final adventure was at the Reader Rock Garden right near the Stampede grounds. We have driven by it at least a million times since we moved here but never bothered to go in. 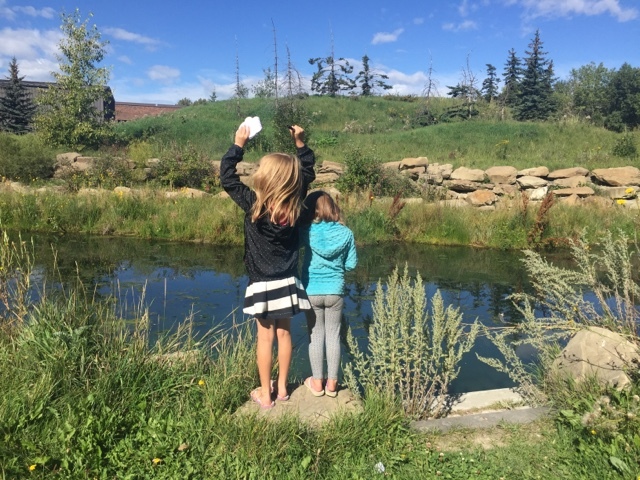 It is names after William Roland Reader, who was the superintendent for the City of Calgary Parks and transformed this hill into the beauty it remains today. The old house is now a cafe on top of the hill that you can book out for events. It's a series of rock paths that tour you around the gardens and even into the cemetery which I believe was Penelope's favourite part of this park. Finley said it reminded her of the Japanese Gardens she saw in Kelowna and in Portland. 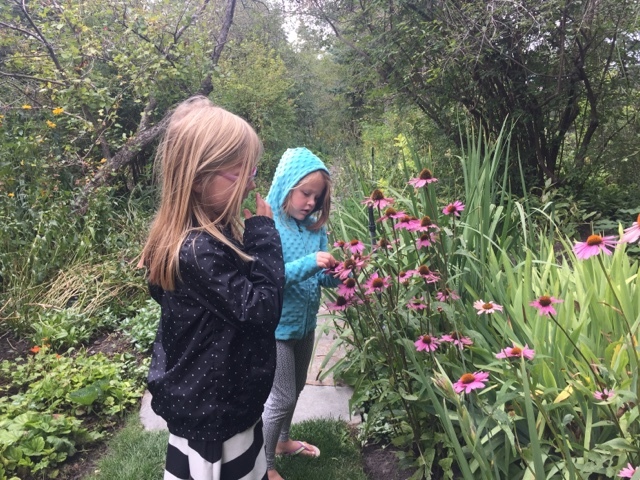 She's not wrong with this as I got that vibe too, the difference being that these are all blooms that grow locally to the Calgary horticulture environment. We had such a fun day exploring both new and old parks for us and it was a great way to take advantage of some warm morning weather. Just as we finished up at the rock garden, the rain started to fall and the wind picked up. Perfect timing on our part.